Final DOOM is now available in stores and direct mail order. It contains two new 32-level replacement WADs for DOOM2, and an updated executable to allow full text replacements for the level names in the maps and the intermission texts. You can get the most recent information on Final DOOM from the web pages of id Software and GTInteractive (id's distributor). 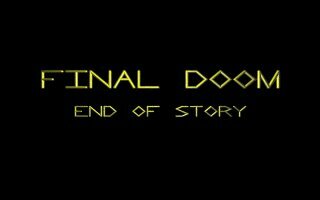 So, what's in Final DOOM? TeamTNT members made all the levels, new music and new graphics in Final DOOM. It's two 32-level sets, TNT:Evilution and The Plutonia Experiment. TNT: Evilution should be played first, since it starts out easy and gets harder as it goes. TNT:Evilution is a 32-level replacement for DOOM2, which includes dozens of new graphics, new music, and some of the most interesting DOOM levels ever made. The Plutonia Experiment is another complete 32-level replacement for DOOM2, created entirely by two TeamTNT members, Dario and Milo Casali.